This recipe is a simple winter warmer that anyone who is old enough to operate a frying pan and use a kitchen knife can make. And if you fall into the younger brackets of that age group, I think you should make it. Here’s why. Christmas is the time of year that children have oodles of time on their hands, and weary students trundle home for a break from their studies. It’s the time of year that parents break the bank to spoil their loved ones, and also pick back up the full time care of their children, no questions asked. To have one of their own offer to take over the cooking, even for just one meal, would be a huge help to them and greatly appreciated. All you will need to make this delicious and hearty stew (beyond the ingredients) is a frying pan, a knife and a slow cooker, or an ovenproof lidded saucepan. The measurements below are for a slow cooked meal. 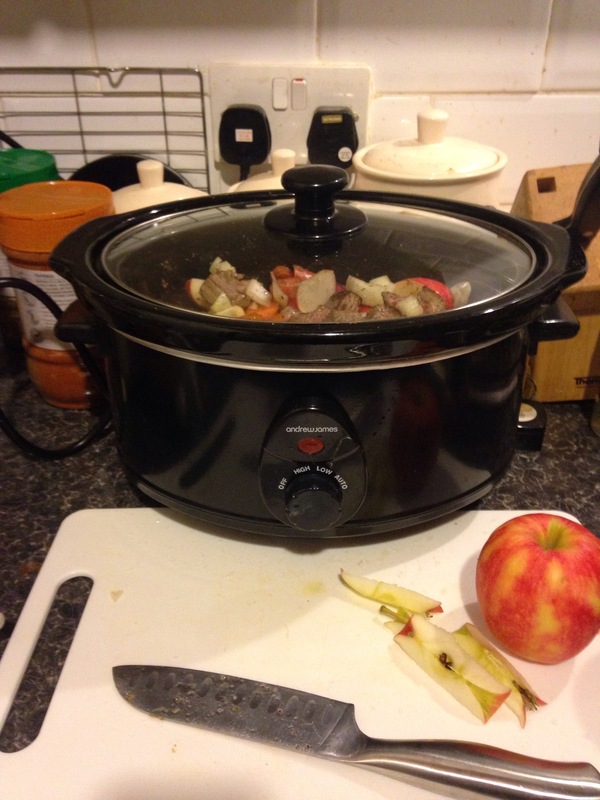 If you don’t have access to a slow cooker, reduce the cooking time to two hours, and add at least an extra litre of water. If your beef isn’t already in bitesize chunks, cut it up. Then, brown it in a frying pan, taking care not to overcrowd the pan. You want nice caramel colouration on all sides of the pieces. 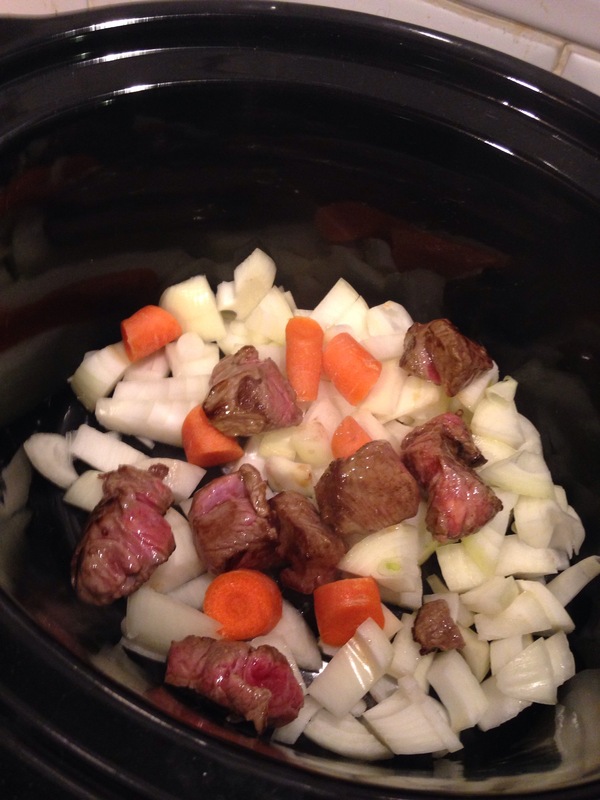 Once browned, pop the cooked beef into the pot of your slow cooker. Core the apple, and chop it and the other veg into bite size pieces. Add them to the pot and mix them into the beef pieces. Sprinkle over the herbs, crumble in the stock cubes and add plenty of salt and pepper. Pour over the cider and mix the ingredients together. This may seem like a rather small amount of liquid, but so long as the liquid is about half as deep as the whole mixture, you should be fine. Pop the lid on the slow cooker and turn it on to ‘high’. Cook for 3 hours. Serve with mashed potatoes, braised leeks and any other veg you fancy. This recipe is pretty flexible- it would work very well with pork or rose veal, and you can replace the cider with beer or water if you like. You can also feel free to add other vegetables, or reduce the beef and up the veg content. The final product, after barely half an hour of actual labour, is aromatic and flavoursome. 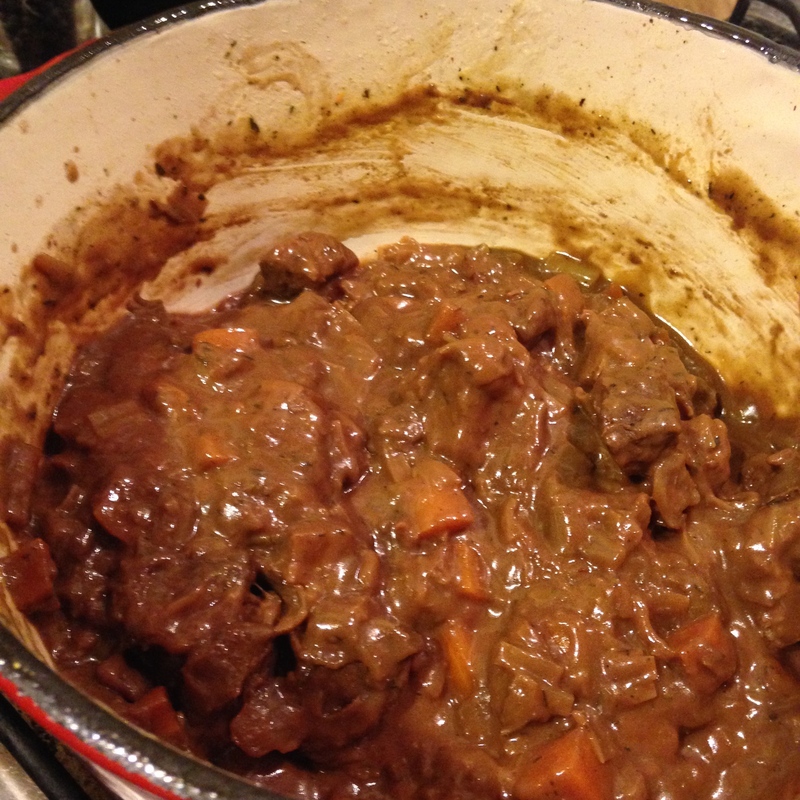 The cider gives tart fruitiness, while the beef makes it intensely savoury and satisfying. The apple will likely melt away to thicken the gravy, leave the inoffensive peel to blend in with the other veg. If you want to be pedantic and peel your apples, then do, but it really isnt necesscary. So there you have it- an incredibly easy and tasty meal to warm your cockles this winter. I love Texmex food- I think you’d be hard pushed to find anyone who doesn’t at least like the stuff. Comforting rice or corn, filling, delicious meat, rich tomatoey sauces and warming spice; Tex Mex is the real deal, and great comfort food. I love how hearty and filling it is, yet how light and summery those same flavours can be. I hated spicy food growing up, and I was the fussiest eater known to man. I started growing out of it, weirdly, when I got my first rats. I’d buy vegetables for them and think, hey, if it’s good enough for them… and once the first hurdle was passed my attitude changed. When it came to new foods I figured, hey, if I don’t like it, I won’t eat any more of it. I’m sure glad I became more adventurous, even if I did miss years of delicious veggies and tasty spicy meals. My mum did most of the cooking when I was a kid, but both my parents could cook a really hearty chilli, usually out of a repurposed Spag Bol. I love my bolognese too much to change it, except into a lasagne, so these days when I cook my super tasty and aromatic chilli, it’s from scratch and to purpose. I’m pretty sure quote unquote “traditional” chilli doesn’t have red kidney beans in it, but mine does. My parents’ always did, and I love the buttery, nutty texture of the beans. It probably also doesn’t have fresh carrots, or peppers, but again, my ‘family’ recipe always had carrots in from the bolognese sauce, and I love the colour and flavour the fresh peppers bring to the dish. Also, you know, vegetables. They’re kinda good for you and stuff. Looking at the recipe below, there are loads of ingredients, yes, but this is really a simple dish to make, promise. Chop your onions and get them sweating in the oil over the medium to high heat. Next chop your carrots into half moons, adding to the pan as you go. Finally chop up your peppers and add them to the mix. Sweat the vegetables off together for about 5-7 minutes, making sure they don’t catch. Measure out your spices- use your favourite chilli powder, and go as hot as you dare. This is also a good time to put the kettle on. Add the spices to the pan and stir them through the vegetables over the heat to warm them. Add your meat and with the spoon break it up, turning it through the vegetables as it browns. Add a pinch of salt and a couple of pepper. Dissolve the stock in the water. Add the tomatoes to the pan and rinse the tin out with a splash of stock. Add this to the pan, followed by the rest of the stock. Stir through. Let the mixture simmer for 20-30 minutes, checking it and stirring it every 10-15 minutes to ensure it doesn’t catch. Taste and adjust the seasoning (chilli, salt and pepper) to taste. When the mixture is nearly reduced enough, drain and rinse your beans and stir them into the sauce. Cook for a further 5-10 minutes. Serve with rice or a jacket potato, plenty of cheese and sour cream. This Chilli is so rich and flavoursome and comforting I can eat it cold in sandwiches. It’s also a great filling for quesadillas and stuffed peppers, and scrummy on nachos. It’s such a joy to make because it’s so easy- all the stages of prep fit in to one another so perfectly and it doesn’t take too long to thicken and finish. This is a great recipe for students, newbie cooks, those feeding hungry kids and teens and even for a single career-girl in her mid twenties like me- extra portions freeze perfectly. This recipe yields a good five portions, seven more modest ones, so it’s a lovely thing to throw together for friends for a chilled out tea together. Like I said earlier in the post, I think the bright spice flavours make this lovely for summer (whether on the jacket or in lettuce wraps!) yet warm and cosy for winter (with lots of rice or potatoes). Of course, it’s easy to customise too- you can swap the beef out for turkey mince or Quorn mince for a start. If you love garlic, feel free to add some minced cloves in with the onions, and you can replace the dried chilli powder for two fresh chillies, or add both for a really potent mix. 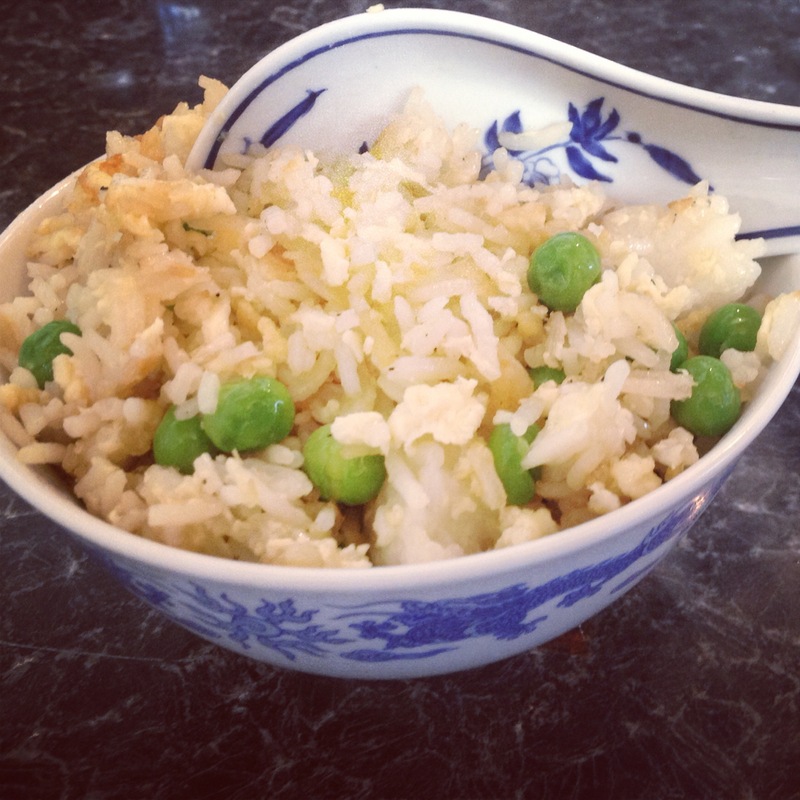 … a staple from the takeaway, but sinfully easy and satisfying made at home. When working from home a couple of weeks back, I had a hankering for something tasty to get me through those last few hours before quitting time. I wanted a one pot wonder that would be quick enough to cook and scoff before I had to get back to work. So, I dusted off my wok, got out my pre-cooked rice, and got to work. Please note that I used my wok, but you can do this is a frying pan, and customise as you like. Get your wok and oils hot. They should be shimmering, a dash of smoke is ok. Beat the eggs and set aside. You’ll want them pre-beaten before adding them to the pan later. Rice in pan time! Either crumble the rice apart in its packet, or give it a fork through in its container, before adding it to the pan. Stir with a wooden spoon or spatula to coat all the rice in oil and get it frying. 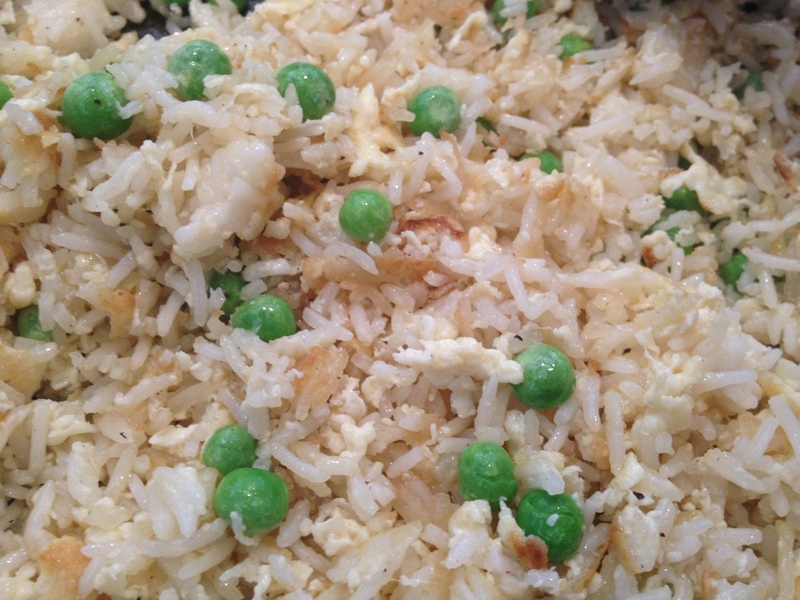 When the rice is browning, add in your eggs and stir, stir, stir! You want the eggs to coat the rice, and keeping them moving will help them cook evenly into flaky clinging pieces, like in takeaway rice. When the mixture is beginning to colour (the egg will be cooked through by then, don’t worry) add in your peas. I add mine in frozen. They take about two minutes of stir frying to cook through. This is also the time you can add scallions, chillies, pre-cooked meat or any other additions you’d like. Season with salt and pepper. Seasoning earlier can make the eggs rubbery and help them overcook. The whole meal takes about 5-10 minutes from prep to plate, but be careful, it’ll be scorching straight from the wok! If you like your rice spicy, add the spices with the veg or other ingredients to make sure they cook, but I wouldn’t douse it in soy sauce or any other seasoning liquid until just before or after serving. There you have it; simple, pretty healthy eating that feels like a takeout treat. Enjoy!